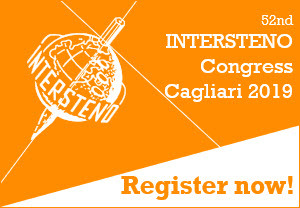 All (personal) data we collect through the congress registration form are stored in our congress database and will be used for the organization of our congress in Cagliari 2019. Members of the board, the organization committee, the jury and the secretarial staff have (partially) access to these data in function of a smooth organization of the congress. For certain congress activities like youth event, excursions, fare well event… lists with names, countries and languages can be delivered to the eventual external partners, involved in the organization of these activities and only in function of the good organization of that activities. With their personal login, all congress participants have access to the data we have stored (Personal Info > My personal data). On simple request at register@intersteno2019.org we will update/actualize these data. By registering to our congress, participants accept that all congress participants, with their login-account, have access to a general list of all congress participants, containing names, countries and eventual participation to competitions and events. Participants at the competitions agree that the result lists of all competitions are published for everybody on the congress website, on the INTERSTENO.org website and in the printed result lists that will be spread. The result lists contain information about all successful competitors. The data in the result lists are considered as part of our patrimonium and will never be destroyed. Other data are stored for 10 years in our archive database. By using the form to pre-book hotel accommodation, participants accept that these data are forwarded to the chosen hotel. A backup of these data is stored in our congress database. Data of participants will never be forwarded to third parties for marketing goals. Email addresses of participants can be used to inform on next congresses and events of our federation. Email addresses will be added to the list of email addresses that receive our e-news, max. 6 times/year. On simple request an email address can be deleted from that list. By participating at the 52nd INTERSTENO congress, you accept that photos and video material that is taken during the different congress activities can be published on our websites and can be shared through social media. For all information on GDPR you can contact us at gdpr@intersteno2019.org.